She’s no gal o’ mine. So this explained the reaction but not why the people who suffered it harbored the alpha-gal antibody (Immunoglobulin E, IgE). Platts-Mills then dug deeper to find the source of exposure to alpha-gal that would have resulted in the creation of its antibodies. He interviewed the patients in the study and found a strange but provocative commonality: they had all been bitten by ticks. Further, the geographic areas in which the allergy was most prevalent coincided with those most prone to Rocky Mountain fever. The dots began to connect. A hunter appearing in Platts-Mills’ allergy clinic reported that he had experienced three separate severe allergic reactions after eating beef, which also contains alpha-gal. The hunter told Dr. Platts-Mills that his feet were covered with tick bites. After that, Platts-Mills began to screen allergy patients for tick bites and IgE. Because you can’t ask another person to willingly subject him/herself to a tick bite, Platts-Mills went hiking in the Blue Ridge Mountains near Charlottesville, Virginia with the intention of attracting ticks. Some hours later, his feet began to itch and a rough rash had developed on his ankles. 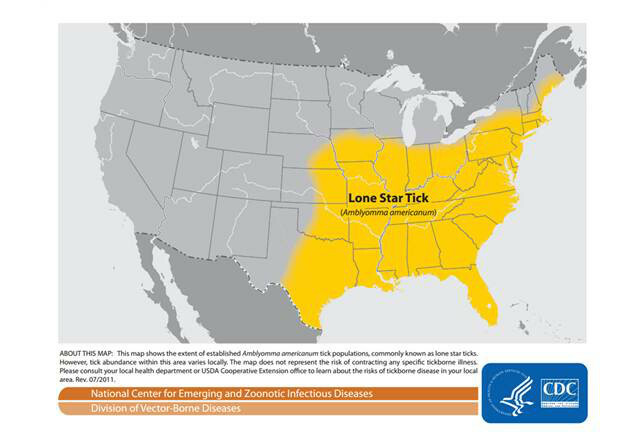 He suspected this was caused by bites from the lone-star tick–the most common tick in the Southeast. The lone-star tick is named so because of a marking on the backs of the females that resembles the shape of the state of Texas. 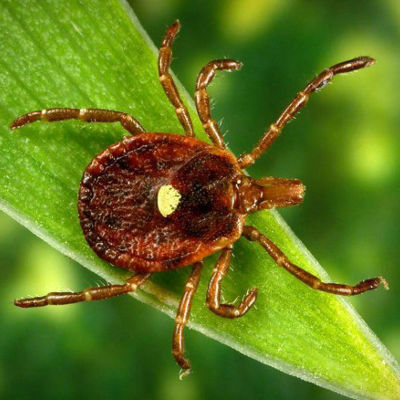 It is known that this little parasitic cousin of the spider carries many pathogens, including those that cause Rocky Mountain Spotted Fever and ehrlichiosis, a general term for several bacterial diseases caused by tick bites. The allergist tested himself after his hike to find that his IgE levels had spiked. Some time later, he ate lamb chops and awoke hours after eating to find his body covered in hives. For two years after that, clinic screenings for red-meat allergies revealed that over eighty percent of those who experienced them had been bitten by a tick; a study published in 2011 showed a twenty-fold increase in IgE after being bitten. The doctor and his colleagues then concluded that the saliva of lone-star ticks sensitizes humans to alpha-gal, resulting in an allergic reaction. Ticks are nourished by the blood of mammals. Their saliva gets mixed with the blood of the host when they bite. Because of its bioactive components, tick saliva may have positive health benefits for humans. A study at St. Louis University found that chemicals in tick spit may have therapeutic value in treating human myasthenia gravis, an autoimmune disease. Several other studies are exploring the potential of tick saliva in treating other diseases in light of its complex and potent antihemostatic, anti-inflammatory, and immunomodulation properties. Accidents often have unexpected consequences.